Hydrogen Peroxide Solution 6% 20 vols is used as a mild skin disinfectant for minor cuts, wounds and skin ulcers or as a mouthwash or gargle solution. Hydrogen Peroxide Solution 6% 20 vols: For skin disinfection: Dilute a portion of the peroxide with an equal amount of water. Soak some cotton wool in the solution and use it to dress the wound as required. As a mouth wash or gargle: Dilute a portion of the peroxide to five times the amount of water. Use this solution to rinse the mouth 2-3 times. Repeat three times a day. Hydrogen Peroxide Solution 6% 20 vols: Active Ingredient: Hydrogen peroxide 6% w/v. Also contains: Phosphoric acid, phenacetin and purified water. 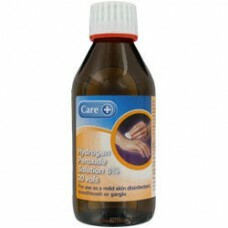 Hydrogen Peroxide Solution 6% 20 vols: Like all medicines Hydrogen Peroxide Solution can have side effects, although these dont affect everyone. As a mouthwash: Temporary swelling of the tongue If not diluted: Irritating burns on the skin producing a white patch. The pain from this will disappear after an hour.